Anaheim peppers are a mild variety of chile pepper typically used in Mexican and Southwestern cooking. Mainstays of American-Mexican cuisine, canned green chiles are made from Anaheim peppers and provide a nice flavor and some added heat to a dish. If you're wondering if Anaheim peppers are named after the city in Southern California, then you'd be correct. They were first grown here commercially by a businessman named Emilio Ortega who founded the company that still sells canned green chiles under his name. 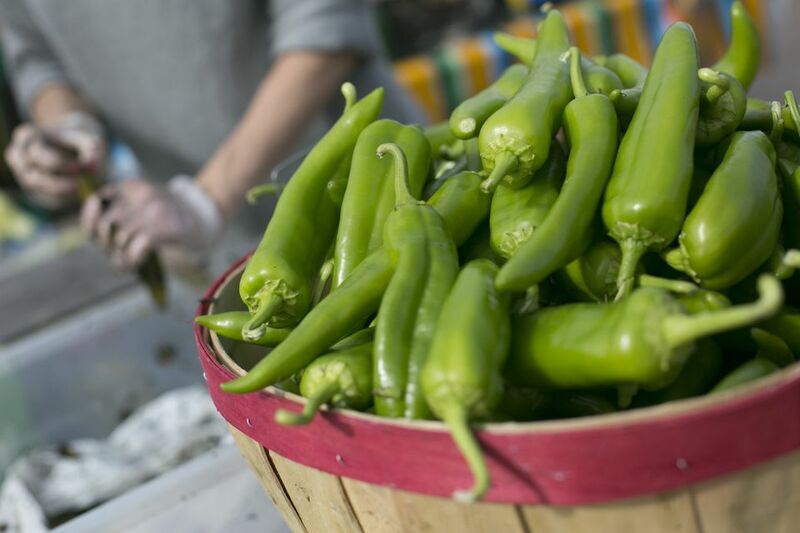 But while Anaheim peppers are named after the city in Southern California, they actually originated in New Mexico, where a slightly hotter version is cultivated to this day. This hotter version of the Anaheim pepper goes by the name of "New Mexico chiles" or sometimes "Hatch chiles," Hatch being the name of a town in New Mexico known for its chile crop. Did you know that peppers are a fruit? And, like any fruit, they come in a wide array of varietals and hybrids. Even within the category known as Anaheim, varietals with names such as "Big Jim" and "No. 9" are typical. Anaheims can be harvested while unripe (i.e. still green), which is how the bulk of them are used in the canning operation. After roasting, peeling, and seeding, the chiles are canned, and they are remarkably stable. They can also be left to ripen on the plant until they turn red, in which case they're referred to as chile colorado (the word colorado means "red" in Spanish) or California red chiles. These can be dried and ground for use as a spice, or as a component of spice blends like chili powder. Anaheim peppers register between 500 and 2,500 Scoville heat units on the Scoville Scale, which is certainly mild enough to eat raw. The variation in heat is mostly related to differences in soil and the amount of the sunshine the plants get. More sun equals a hotter chile. Like Poblano peppers, which they resemble, Anaheim peppers are often used for making one of the most popular American-Mexican specialties, the classic chile relleno, where the pepper is roasted, stuffed with cheese, then coated in egg and fried. This is mainly because they're big enough to stuff and because they have a roughly equivalent heat level. Anaheims are a little more narrow than Poblanos, with a lighter green color and a fruitier flavor, which doesn't necessarily lend itself as being the ideal pepper for this dish. But that's not a problem. Use Anaheims in their canned green chile form to provide an extra bit of flavor and heat to your taco meat or nachos the next Taco Tuesday that rolls around and you'll be pleasantly surprised. You may even start keeping them as a staple for when you make tacos. What Is an Ancho Chile Pepper?